Difference between revisions of "ATL 3.0.0 New and Noteworthy"
ATL VM stack traces are formatted to support hyperlinks. Those links open the ATL editor at the specified line if present, at the top of the file otherwise. ATL3.0.0 provides console hyperlinks which allow to follow errors just by clicking, as you can see below. ATL now embeds its own set of ant tasks, which are quite similar to the AM3 ones. The task API is extensible and can be improved to support new functionalities – or to redo old AM3 ones. An example of ant launching is integrated into the Public to private Example. ATL now embeds its own set of ant tasks, which are quite similar to the AM3 ones. The task API is extensible and can be improved to support new functionalities – or to redo old AM3 ones. 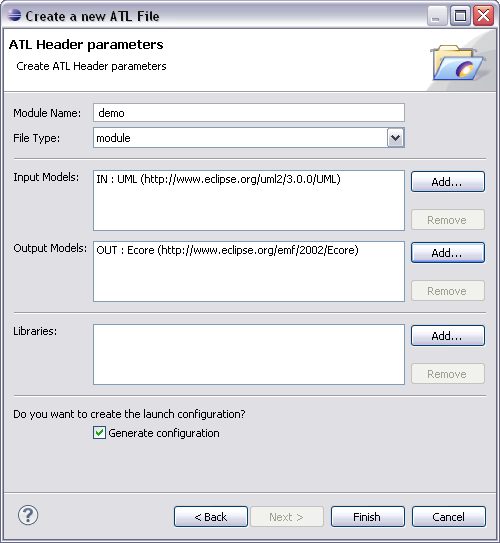 [http://dev.eclipse.org/viewcvs/index.cgi/org.eclipse.m2m/org.eclipse.atl/examples/org.eclipse.m2m.atl.examples.public2private/launch/build.xml?root=Modeling_Project&view=markup An example of ant launching] is integrated into the Public to private Example. The ATL Toolkit is now compatible with Eclipse Galileo (Eclipse 3.5, EMF 2.5). 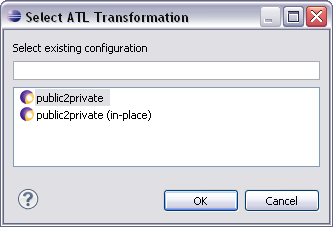 ATL is still compatible with Eclipse 3.4, 3.3 and 3.2. The ATL file wizard has been refactored to improve user guidance when creating a new ATL file. 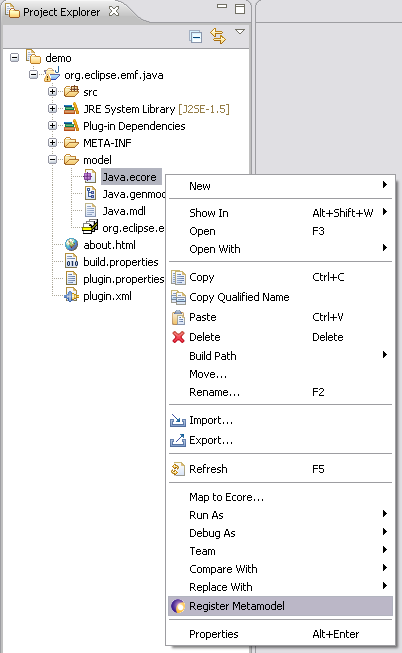 You can specify metamodels URIs/paths (for content assist inside the editor) and generate the corresponding launch configuration. Then, to launch the transformation, you just have to specify model (input, output) paths in the launch configuration window. ATL editor now allows code folding, which can be useful when developing large ATL files. if there is no launch configuration based on the current file: this will initialize a new configuration based on the current ATL file and open it to configure paths (models, libraries...). 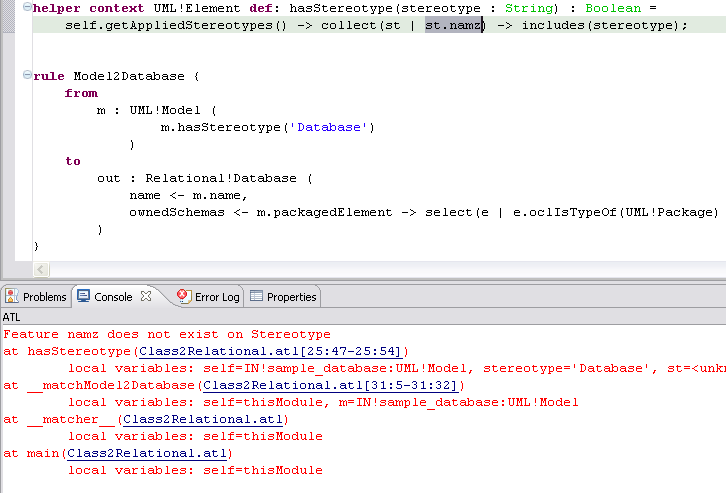 ATL provides, under the ATL perspective, the "Register Metamodel" action on .ecore files. This action reads the .ecore file and registers it into the EMF Registry. This is useful in the case you only have an ecore file as metamodel and you don't have the generated EMF plug-ins installed: in this case usually you can't open models conforming to the ecore metamodel into the EMF xmi default editor. Using the "Register Metamodel" action, you will be able to open such models. ATL perspective provides two new actions available on projects, by right-clicking: under the ATL perspective, you can now convert any project to an ATL project. This action adds the ATL nature to the project, which makes every .atl files inside of the project to be compiled as a .asm file. You can remove the ATL nature from an ATL project, regardless of the perspective you are in. ATL refining mode consists on transforming a model itself, only rules that do not perform simple copy need to be specified, with all bindings (similar to superimposition but with an implicit copy transformation). In the first refining mode version, the ATL VM was copying the whole model to a new one, applying modifications specified by the rules at the same time. It was not enough efficient and there was no identity preserving. In that release, the refining mode works by performing in-place transformation. It still keeps ATL semantics (i.e., write-only target model during rule execution) but performs well-enough for interactive usage and preserves elements identity. This page was last modified 11:37, 25 August 2009 by Fr. Based on work by William Piers.